Over the years, the coffee table has gone from involuntary storage in the living room for every miscellaneous item in your home, to a room’s focal point. Designers are shifting focus and using their eye for styling to create the perfect living room “centerpiece.” However, there is a method to the madness. Finding the right decor for your coffee table is crucial to keeping it balanced and chic. 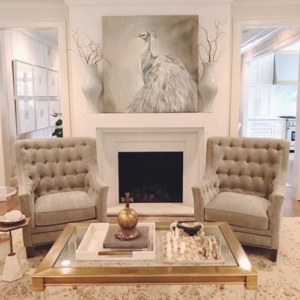 We sat down with Shannon Mahon, owner of Mint and Shannon Mahon Interiors, to learn how this local talent is turning the (coffee) tables. Shannon Mahon. Photo via Shannon Mahon. Adding a few large hardback books is a great way to create a coffee table base. Feel free to make it personal–if books about travel or photography are more your style, use those instead. Placing a pot of greenery on your coffee table is a great way to add a pop of life. Fresh plants and cute succulents add character to your coffee table and make the space feel a little more luxurious. Photo via Shannon Mahon Interiors. Instead of just placing each item onto the coffee table, choose a mixed-metal tray to create a safe space to hold your decor and keep everything organized. Using trays to hold items keeps the table balanced and decluttered. Creating dimension is another requirement for styling the perfect coffee table. Finding a “vertical” piece such as a vase or a statue is a great way to make everything seamless while adding height, notes Mahon. Vertical pieces add height and look great stacked on top of those hardcover books. Throwing in a random object can spice up the table and speak to your personality. It’s important to stay true to your personality through the items that you choose. Let your coffee table do all the talking! To learn more about Shannon Mahon Interiors, scroll through Mahon’s Instagram here or see her design expertise at Mint.